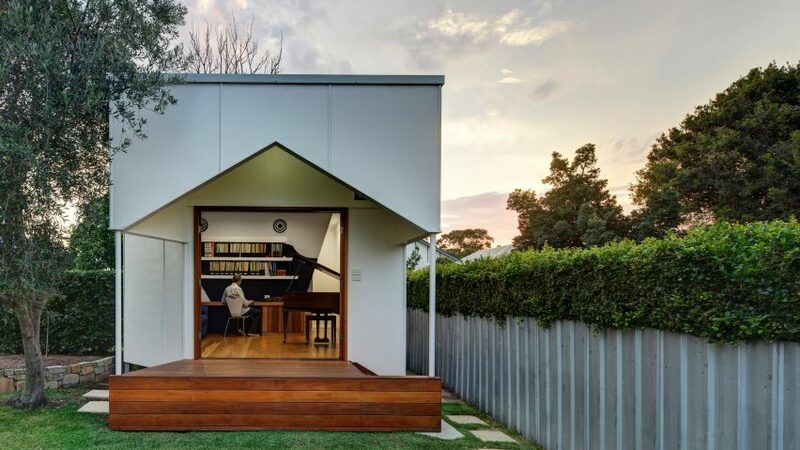 This music studio in the garden of a home in Newcastle, New South Wales, is entered via a house-shaped porch that doubles as an outdoor recital space. M3 Architecture was asked by the client, who teaches string instruments, to create a separate space on the property where he could compose music and practice with students. "Teaching had occurred out of the front bedroom of their home, with obvious effects on the privacy and logistics of family life," the firm's director Michael Banney told Dezeen. 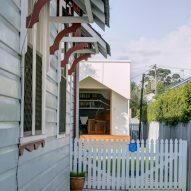 "Hence they were very keen to move the teaching function out of the house proper – the back yard was the only place available," added Banney, who designed the space for his brother. "The design creates a unique backyard pedagogy – a spatial environment that enables students to drift in and out of practice and performance." 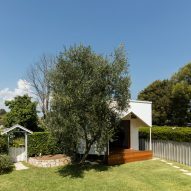 Working within a limited budget, Banney and his team employed a selection of inexpensive materials to erect the studio, which is placed next to an existing olive tree. The walls and ceiling are made from plasterboard, while fibre cement has been applied as cladding. The gabled porch extends from the studio's front, covering a decked stage area. The studio's white-painted exterior, warm-toned timber flooring and navy rear wall are a subtle nod to Finnish architect Alvar Aalto's Finlandia Hall, which features a similarly pale facade and deep-blue interior details. "The duality of the project links two worlds – the high architecture of a public building, and the DIY aspect of a backyard," explained the architects. Measuring at over three metres in height, the structure's raised ceilings help sound reverberate throughout the room. The practice has also fitted the space with a heavy curtain that can be drawn across two walls, should inhabitants want to moderate acoustics. 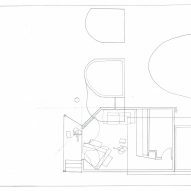 Completed with a small bathroom at its rear and a fold-out sofa bed, the studio can double up as a guest room when the grand piano is rolled back. As well as residential projects, Brisbane-based M3 Architecture also specialise in creating educational and public buildings. Previously the practice has designed a centre for abused children in Queensland, which features decorative concrete walls and play areas sheltered by a scalloped canopy.